Try this is you haven't! We wanted french toast this morning, but had no white bread. We did however, have a loaf of cinnamon raisin bread. So we thought...might as well try it. 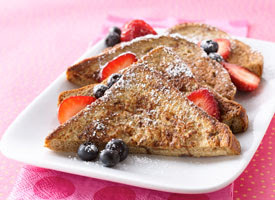 Well, it was a great experiment, and may be our new fav french toast concoction to date. So give it a try! You'll thank me!! !